Short stories have become popular again with readers. For writers, flash fiction in its required minimal word count is challenging . Pagan captures the essence of the form in her description. When well-written, flash fiction sparkles like gems in the mind. I opened Up, Do at random and read, “Time Machine” by Melissa Webster. In its brevity, it evoked as strong a response as I had with the three hour movie in theaters now, Interstellar. Flaherty Pagan earned her MFAW from Goddard College and founded the mission-oriented indie publisher Spider Road Press. 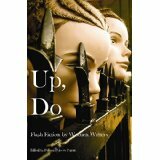 Up, Do is available on Amazon and Kindle.